Sam Jones’ I am Trying to Break Your Heart is, simply put, a masterpiece. Unashamedly simple, its fly-on-the-wall approach recalls that of Pennebaker’s Don’t Look Back and captures, as it unfolds, the most public of battles between artist and executive, chronicling the recording, rejection, resale and release of Wilco’s fourth album, 2002’s Yankee Hotel Foxtrot. I am Trying to Break Your Heart begins during the recording sessions for Yankee Hotel Foxtrot and succeeds in breaking the viewer’s heart as one watches an optimistic band record while pausing to sing the praises of their record label, Reprise, for giving them a free hand in the execution of their album. “They’ve given us $85,000 to record it,” laughs bandmember Jay Bennett, “and they haven’t heard a word of it.” Moments like this are the heart of the success of this film as the viewer knows already where the story’s going, but the band and filmmaker had no idea. We know it’s all going to fall apart – it’s just a matter of time. That said, I am Trying to Break Your Heart taken as a whole is far greater than the sum of its parts. There are no exquisite epiphanies, no shocking revelations, no high drama (even the discreetly acrimonious departure of Jay Bennett is downright tame and civil by rock and roll standards) – and there is no new documentary innovation present – simply a moment captured and a story told, albeit one fans already know – but director Jones, and especially editor Erin Nordstrom, creating more “moving pictures” than motion picture. Every frame, a warmly grainy, comfortable black and white, evokes a gray Chicago morning, the weary optimism of frontman Jeff Tweedy, and the unassuming, austere, yet inconspicuous intricacy of Wilco’s music. 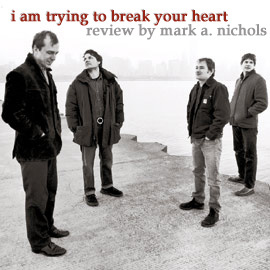 I am Trying to Break Your Heart will almost certainly appeal to Wilco fans as band personalities are exposed, the recording process is revealed, and those perfectly imperfect Wilco performances are interspersed throughout it all. This reviewer’s only wish was that some Reprise Records points of view were shared (one would guess they probably declined comment). Bennett’s departure is only briefly discussed after the fact, though the informed viewer knew to expect it and could therefore pay special attention to strained studio interactions between Bennett, Tweedy, and other bandmembers. Non-fans may also find the film of interest, especially if they come to the film unaware of the story behind it. I am Trying to Break Your Heart certainly has the potential to draw new fans as it features some absolutely wonderful performances from the band and touches on the humanness of this down-to-earth band. Never posing as rock stars nor fleeing in the opposite direction as unapproachable, enigmatic, hipper-than-thou slackers, Wilco, and especially Tweedy, come across as the musicians down the street; writing, playing and recording simply for the sake of the song.